That’s quite a laundry list but the basic idea is a simple one: use media of all kinds to give the work of the Fellows as much impact as possible. 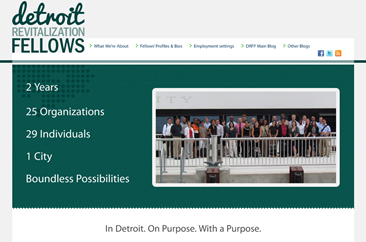 We now have the website up for the Detroit Fellows project. I’ve been working closely with one of the Fellows, Eric Anderson, on the creation of the site. The site has a Fellows group blog where they’ve started blogging and where Jay has published some of his Fellows’ profiles. We also have our own Citiscope/Detroit Fellows blog where Curt, Jay and I now have our initial blog posts up. My job is to offer coaching to those Fellows interested in using social media tools as a way to leverage their leadership. We’ll focus mainly on blogs and Twitter. I’ve been speaking to each of the Fellows by phone in the past couple of weeks to introduce myself, learn more about their work, and give them a quick overview about the kinds of things my coaching would involve. I hope to start working with a small group in April. I’ve been coaching leaders in the use of blogs and other online tools since 2003, but this will be the first time I’ve taken on a group of community leaders. I’m looking forward to it.